Good evening everyone! The clouds enveloped us just before dark with a light misty rain. The temperature at 5:45 was 49 degrees. Our weather forecast continues to show a winter weather advisory in effect until tomorrow at 1:00 PM with possible snow and ice accumulations. This could be our snow of the year! Two 15 inch round cutting boards! I decided I needed to offer a new design board this year for the Holidays! What I came up with is a take off from the teardrop board I offered last year during the Holidays. The teardrop cutting board last year did not have a handle. Any of these boards would make a great Christmas gift for family or friends! All of my boards are handcraft one at a time, so allow plenty of time for me to make the board and don’t forget about shipping transit time! Be sure to check out my Testimonial page! A good friend of mine gave me a block off spalted maple so I decided to turn a lidded box on my lathe. The block was 6 x 6 x 4 inches thick in size and the corner had a bad place that was too soft. I started buy cutting the block into a circle and then mounted it on the lathe. After turning both the bottom and the lid, I then turned the finial from a scrap piece of blackwood. after turning the finial and before parting the piece I made sure that I cut a tenon so that I could mount the finial to the lid. This box measures 5 inches in diameter and 3-1/8 inches high, I think it turned out really nice! I have to tell you, you need to try Talenti gelato if you have not tried it! It is absolutely wonderful! It’s available in a variety of flavors and is delicious. It is a little expensive but we find it on sale all the time, buy one get one or four for $8.00. I like all the chocolate gelato and the butter pecan is really good too! If you have had Talento, what is your favorite flavor? Check out my handcrafted Cheese Boards and Honey Sticks! They make a very nice gift! Here are a couple more sunrise pictures from my trip to the beach last week! Our rain has stopped after4 days of rain and a cold front has moved in with cooler temperatures! Have a great week, it’s hump day is nearly over! 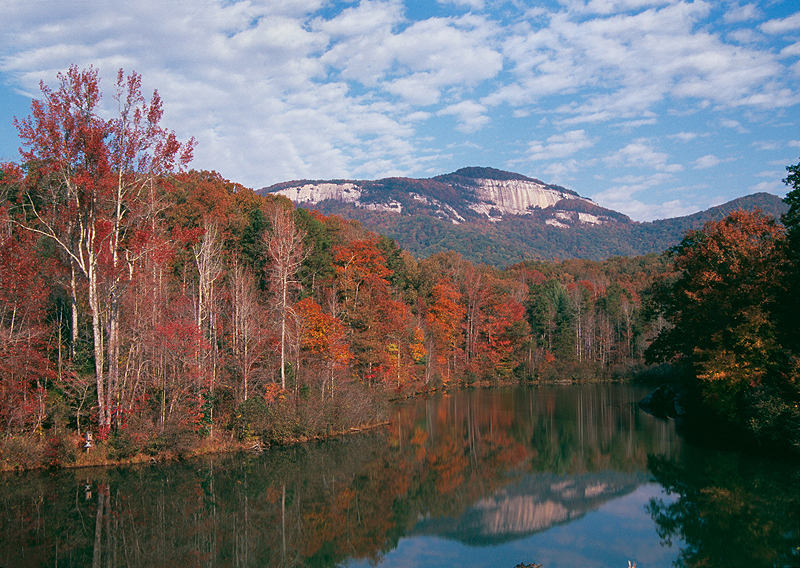 A short drive south from us is Table Rock. There are trails from Table Rock State park that lead you to the summit at 3124 feet. It is a 6.5 mile hike round trip to the summit, the trail is strenuous and in some spots is very difficult. The hike is well worth it, the views are spectacular. Our leaves are starting to change as you can see in this picture! The Clemson Tigers played the Louisville Cardinals at Clemson University yesterday afternoon. It was a 3:30 game that didn’t finish until 7:05 PM. It was a beautiful day but it was extremely hot, 82 degrees. Our seats are on the Northside so we are in direct sun until around 5:15 PM. As you can tell in the pictures Clemson colors are orange!!! There were 81,500 attending this game yesterday! I took the first two pictures just before the game started with the band on the field and just before the team ran down the hill! Louisville has the #1 defense in the country before playing Clemson. Clemson held Louisville t0 264 yards and created 11 penalties for 65 yards. The game went down to the fourth quarter but Clemson was able to win 23 to 17. Check out my cutting boards, cheese boards and serving boards, they make great Christmas gifts!